I went to the trouble of getting a sample PDF of the local ballot this morning and looking up everyone I didn't recognize. This was important because in at least one of the races, it appeared that the non-incumbent had a dead website, wasn't answering calls for interviews, and had a rather questionable past having left the profession ten years ago and only receiving 1% in a previous election (elsewhere). It seemed like a good case of casting a vote even if I didn't particularly know the other guy to make sure someone else didn't get in on a whim. I based some of my decisions on professional background, experience, and other volunteer/elected positions (I've got a bias toward experience and skill), and based my decision around Soil and Water on whether I was happy with the current job as I understood it. I realize I'm supposed to be all, "Something has got to change! This soil and water work is going in the wrong direction and I don't know what the right direction is, but anything has to be better! Out with the incumbent!" But I know they've been testing my local ponds, engaging in ongoing monitoring, expanding the green areas, and I'm generally happy. I might have changed my mind if I thought our S&W rep was getting kickbacks for trying to run that chunk of pavement through Lebanon Hills; but I don't think that's actually the case. 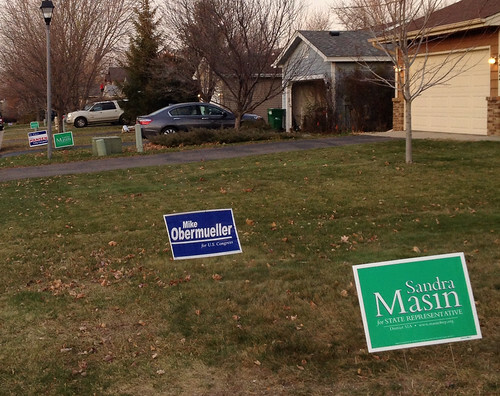 I saw these Masin signs, three deep, on one of the roads through our neighborhood. Just in case anyone thinks Eagan is a red city. My gut feel was more DFL than GOP, but perhaps I notice them more. I guess I'll know after polls closing.